Background Direct quantitative measurement of GFR (mGFR) remains a specialized task primarily performed in research settings. Multiple formulas for estimating GFR have been developed that use the readily available endogenous biomarkers creatinine and/or cystatin C. However, eGFR formulas have limitations, and an accurate mGFR is necessary in some clinical situations and for certain patient populations. We conducted a prospective, open-label study to evaluate a novel rapid technique for determining plasma volume and mGFR. Methods We developed a new exogenous biomarker, visible fluorescent injectate (VFI), consisting of a large 150-kD rhodamine derivative and small 5-kD fluorescein carboxymethylated dextrans. After a single intravenous injection of VFI, plasma volume and mGFR can be determined on the basis of the plasma pharmacokinetics of the rhodamine derivative and fluorescein carboxymethylated dextrans, respectively. In this study involving 32 adults with normal kidney function (n=16), CKD stage 3 (n=8), or CKD stage 4 (n=8), we compared VFI-based mGFR values with values obtained by measuring iohexol plasma disappearance. VFI-based mGFR required three 0.5-ml blood draws over 3 hours; iohexol-based mGFR required five samples taken over 6 hours. Eight healthy participants received repeat VFI injections at 24 hours. Results VFI-based mGFR values showed close linear correlation with the iohexol-based mGFR values in all participants. Injections were well tolerated, including when given on consecutive days. No serious adverse events were reported. 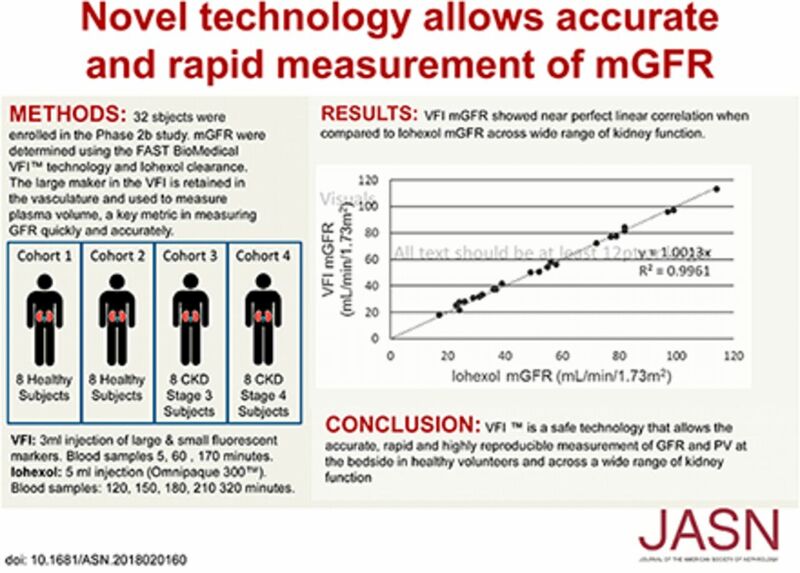 VFI-based mGFR was highly reproducible. Conclusions The VFI-based approach allows for the rapid determination of mGFR at the bedside while maintaining patient safety and measurement accuracy and reproducibility.